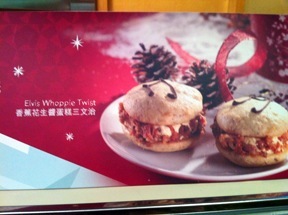 A new (and unfortunately hard to read) Starbucks offering, the Elvis Whoppie Twist. 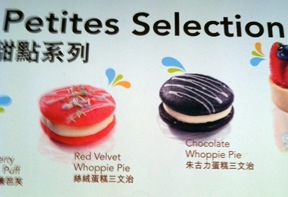 Don’t know if a ‘whoppie’ is a traditional British item, but pairing Elvis with anything will surely kick it up a notch, no? I assume the twist is a reference to his famed hip gyrations? He didn’t sing ‘The Twist’ though, did he? I think that was Fats Domino. Anyway, assuming they go for authenticity, it should be basketball-sized and feed 15+ people just like Elvis’ favorite sandwich, the infamous ‘Mile High Sandwich’ (officially called the ‘Fool's Gold Loaf’). For those of who unschooled in Elvis lore, this consists of a 4-pound loaf of hollowed-out buttered white bread filled with peanut butter, grape jelly, and burnt bacon. It is then deep-fried for good measure. It would serve 4-20 mortals - or one Elvis. A hoodie for sale in Wanchai. Not sure what ‘oream’ is - I assume that’s supposed to be ‘cream’? Not that that would make sense either. I had to snap this photo rather hurriedly, as knock-off stores such as this ironically don’t take kindly to people taking pictures of their copyright violations. I’m assuming this is supposed to be funny in a hip-hopster way? 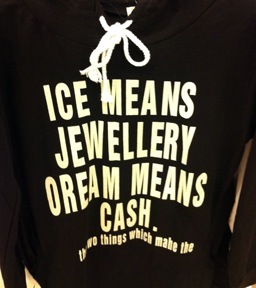 Can’t say that I’m up on my hip hop phraseology, but ‘ice means jewellery, cream means cash’ certainly sounds like your typical tepid faux gansta cliche.